This media resources page provides members of the media with information; resources; and broadcast-, print-, and web-quality imagery developed during the Gulf of Mexico 2018 expedition. From April 11 - May 3, NOAA and partners will conduct an ocean exploration expedition on NOAA Ship Okeanos Explorer to collect critical baseline information about unknown and poorly known deepwater areas in the Gulf of Mexico. The expedition begins in Pascagoula, Mississippi, and ends in Key West, Florida. During the cruise, our at-sea and shore-based science teams will work together to map the seafloor and make deepwater scientific observations in exploration areas. Live video of remotely operated vehicle (ROV) dives can be viewed online in real time from April 13 - May 2. 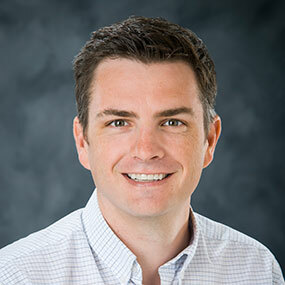 Dr. Adam Skarke is an Assistant Professor of Geology at Mississippi State University where he conducts research in the fields of marine geology and geophysics. The goal of his research is to better understand fundamental physical relationships between sediment transport, morphological expression, stratigraphy, and subsurface fluid flow in seafloor environments that span the continental margin from coastal waters to the deep sea. Adam’s recent work has focused on using geophysical mapping tools, such as multibeam sonar, to detect deep-sea methane gas seeps, quantify discharge rates, and characterize associated benthic habitats. He has participated in 24 oceanographic research cruises and utilized human occupied submersibles, remotely operated submersibles, and autonomous underwater vehicles to conduct seafloor and water column exploration. 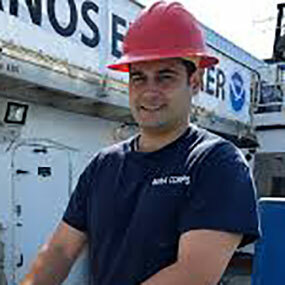 From 2011-2013, Adam was a member of the Okeanos Explorer Mapping Team. In 2016, Adam was named an Early Career Research Fellow by the National Academies of Sciences, Engineering, and Medicine, Gulf Research Program. For additional information please visit: http://www.adamskarke.com . 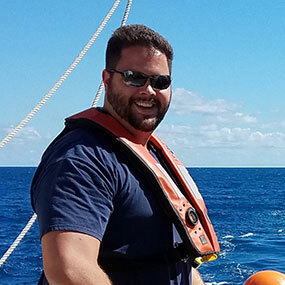 Dr. Daniel Wagner is serving as the expedition's onboard science co-lead and works as the research coordinator for the Southeast Deep Coral Initiative (SEDCI) at JHT Inc./NOAA National Centers of Coastal Ocean Science (NCCOS). 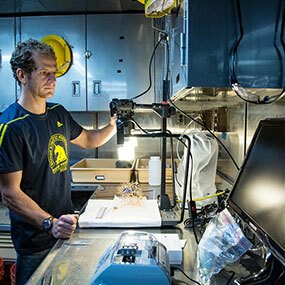 Daniel has conducted research on deep-sea corals since 2006, and has participated in over 25 expeditions that have surveyed deepwater ecosystems throughout the Indo-Pacific, Atlantic and Southern Oceans. His research interests include the taxonomy, life history, and ecology of deep-sea corals, particularly black corals. Daniel received his Ph.D. and M.S. in biological oceanography from the University of Hawaii and a B.S. in Biology from Hawaii Pacific University. Daniel is originally from Ecuador, but resides in Charleston, South Carolina. LT Nick Pawlenko joins OER as Expedition Operations Leader. Nick is rotating to land after three field seasons aboard NOAA Ship Okeanos Explorer. During his time aboard the Okeanos Explorer, Nick was able to work with the ROV team, often sitting in as ROV navigator and co-pilot.